Quartz countertops are rising in popularity, along with granite, as the go-to material for exemplary durability, timelessness, style, and sheer “wow-factor”. Upping the ante beyond a beautiful countertop made of natural materials is the rising popularity of installing quartz as a kitchen backsplash. Marble has always been the backsplash of choice, but comes in a limited selection of colors and because it is porous, it is much more susceptible to staining. As far as marble’s durability, it simply does not compare to quartz. Marble has a low abrasion rating and therefore can be scratched quite easily, and due to its chemical makeup it is very susceptible to damage from acidic solutions (like lemon juice or coffee). Quartz’s durability, stain resistance, and antibacterial properties (being non-porous) are exactly what you want in your kitchen to catch all the water, food, and drink, since it’s so easy to clean. Custom made quartz backsplashes can be made at your local Edmonton quartz dealer such as K&J’s Custom Granite, who can provide you with a wide array of options to help you select the perfect texture and color. Speaking of looks, quartz comes in an amazing array of color and pattern options, with new collections coming out every year from manufacturers like Caesarstone, Silestone, and Hanstone. The options to color match your kitchen and your existing quartz or granite countertops are excellent. Having quartz as a major feature in your kitchen looks outstanding, and even more so when adjacent to a quartz countertop. Quartz is usually cut as a solid slab to order, with the dimensions custom made to your design. Marble on the other hand, is usually cut into tiles and sometimes inlaid with other materials such as metal or glass, to create a mosaic. This means grout, and grout is just another place for stains to accumulate, bacteria to grow, and maintenance to be done. Having a solid slab of quartz eliminates all of this, making cleaning a breeze, reducing maintenance costs, and will withstand a lot more punishment. No more cracked tiles! No more stains! What other advantages are there to quartz vs marble? A huge plus is the fact that quartz, due to its manufacturing, does not need to be sealed. It is a non-porous stone. Marble on the other hand, does need to be sealed regularly, due to it being a porous stone, which will easily absorb any liquids and cause permanent stains if not treated. There are simply greater risks of permanent staining and discoloration with marble, which is a riskier investment in the long run. Choosing quartz instead will lend a greater value to your home as it will last significantly longer if treated well. 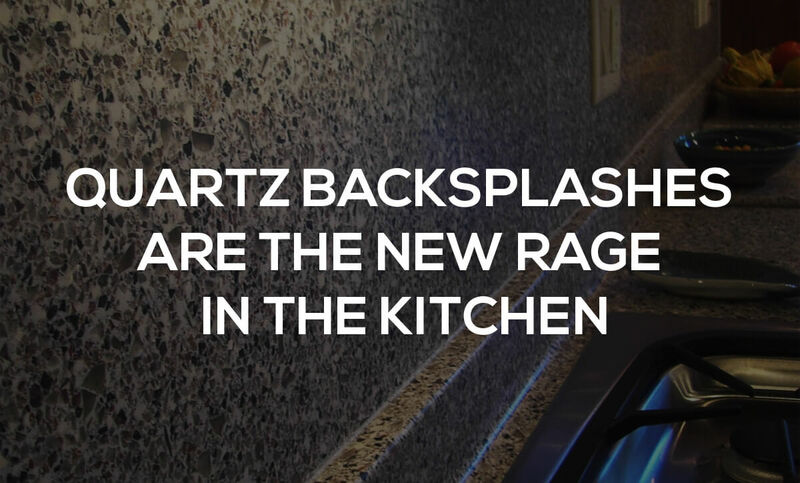 All in all, quartz is becoming the new must-have kitchen backsplash, as it simply is a better choice when all the pros and cons are weighed. Beauty– check. Value– check. Low-maintenance– check!